Each year, the Annie E. Casey Foundation’s national KIDS COUNT program ranks the fifty states in terms of child well-being. The most recent ranking—published in June of 2013—put New Mexico at the absolute bottom, ranking fiftieth among all the states. The rankings are based on an index of sixteen indicators that reflect child health and education outcomes, as well as key economic and family/community risk and protective factors. Of these factors, growing up in poverty is one of the largest threats to a child’s healthy development. States with consistently high child poverty rates, as in the Southeast and Southwest, unfailingly rank in the bottom for overall child well-being. Poverty tends to be cyclical—meaning that most children who grow up in poverty will become poor adults—unless they are provided with opportunities to overcome this barrier and succeed. Given this, it is in the state’s best interests to break the cycle. The national KIDS COUNT program has noted that data “reveal a hard truth: a child’s chances of thriving depend not just on individual, familial, and community characteristics, but also on the state in which she or he is born and raised.” In other words, though state resources and challenges vary, state policies, in particular, have a critical, long-term effect on a child’s chances to succeed. For more than twenty years, New Mexico Voices for Children has published an annual state KIDS COUNT data book, presenting an overview of how our children are doing. 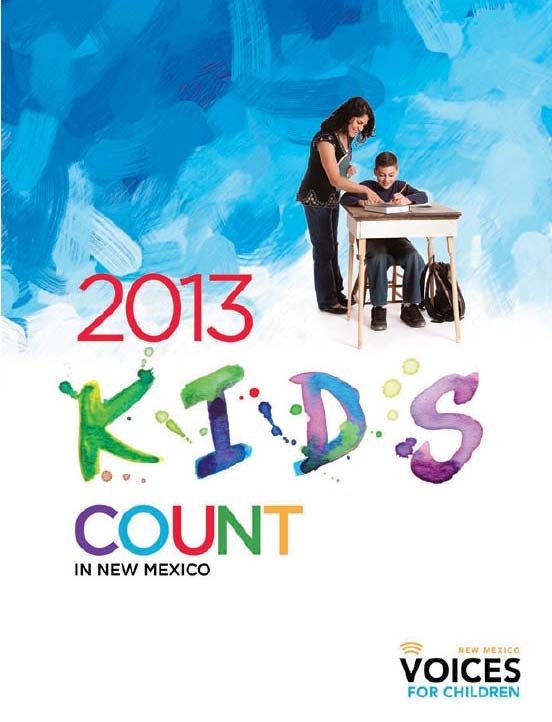 The 2013 New Mexico KIDS COUNT Data Book provides the most current, reliable data at the state, county, and school district levels, to show how New Mexico children and their families are faring economically, academically, socially, and with regard to their health. We present this information to the public, grant writers, and policy-makers to help them determine policies and programs that will best promote and support child well-being and family economic security. Due to our state’s fall to fiftieth in the nation in child well-being, New Mexico Voices for Children is adding a new section to our annual KIDS COUNT report. The Trends and Rankings section tracks the sixteen KIDS COUNT indicators of child well-being, showing us how New Mexico has been faring over time in these critical areas and how the counties rank on comparable indicators. This is a dashboard of sorts that we will use to track progress on child well-being over the next several years. Along with the data, you will find policy solutions for addressing these problems. The policies come from our NM KIDS are COUNTing on Us Policy Agenda for a Better New Mexico. It was created with the input of more than forty partner organizations and individuals in response to the state’s fall to fiftieth. Our policy agenda (which is available online) addresses each of the sixteen KIDS COUNT indicators, which fall into four domains: economic well-being, education, health, and family and community. These indicators are inter-related in terms of their impact on children’s well-being—just as the policies required to improve the status of children are interconnected. The policy agenda outlines a framework of key evidence-based policy solutions that can increase our children’s well-being, as well as improve the economy and quality of life for the whole state. It is by no means comprehensive, rather it offers a starting point for ongoing work. We have included as much data as possible for these indicators, at the county or school district level, in this data book. The NM KIDS are COUNTing on Us Policy Agenda is, in part, a call to action. New Mexico’s fall to dead last was met with resignation and, in some corners, represented a reason to give up the fight for better outcomes for our children. While this may seem like a huge—maybe even overwhelming—task to undertake, the fact is, we can improve child well-being and we must. Nothing less than the state’s economic future depends upon it. But we must address our problems in a comprehensive way. Our current piecemeal approach has delivered us to the bottom of the heap. Considerable investments in the health and early development of children, with a focus on early childhood education. By 2010, British policies had managed to reduce child poverty by half (in 2009, the rate was 12 percent), measured in absolute terms. Not only this, but the country also saw major progress in terms of children’s school achievement and other outcomes, in raising incomes for impoverished families, and increasing single-parent employment. Of course, there are differences in British and U.S. safety net structures, economic structures, populations, and policy-making models. Yet, there are still valuable lessons both the U.S. and New Mexico can learn—and apply to improving the lives of our children—and through this, the lives of everyone else. One is the importance of data- or evidence-driven policies. Britain, relying on the extensive research showing the effectiveness of high-quality, comprehensive early childhood care and education, continues to preserve universal preschool for all three- and four-year-olds, and is funding the expansion of preschool for disadvantaged two-year-olds. Second, and most important, is the fact that, with strong, bipartisan political—and public—will, we’ve been shown it is possible to have a significant, positive impact on child poverty. 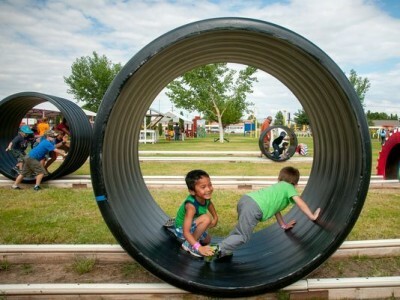 Already some U.S. states and cities are setting goals to reduce child poverty. Other states and cities have made great progress in implementing early childhood care and education programs that are improving student academic outcomes in kindergarten through high school. It can be done, and New Mexico can do it. In the data pages, readers will find the most current information on how our children and families are faring in terms of their economic security, health, education, and in their communities. Despite the knowledge we have of “what works” in supporting families and children, New Mexico does not now have a comprehensive set of policies to provide all children in our state with the opportunities that will help them reach their full potential. 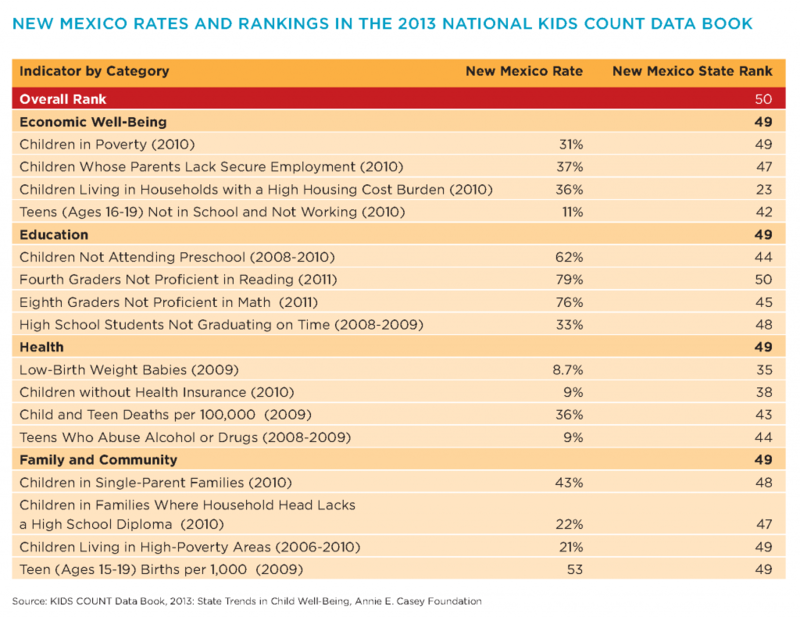 We must do better for our children, and NM Voices for Children/NM KIDS COUNT hope the information presented in this 2013 data book will be helpful to those in the state striving for meaningful, positive change.